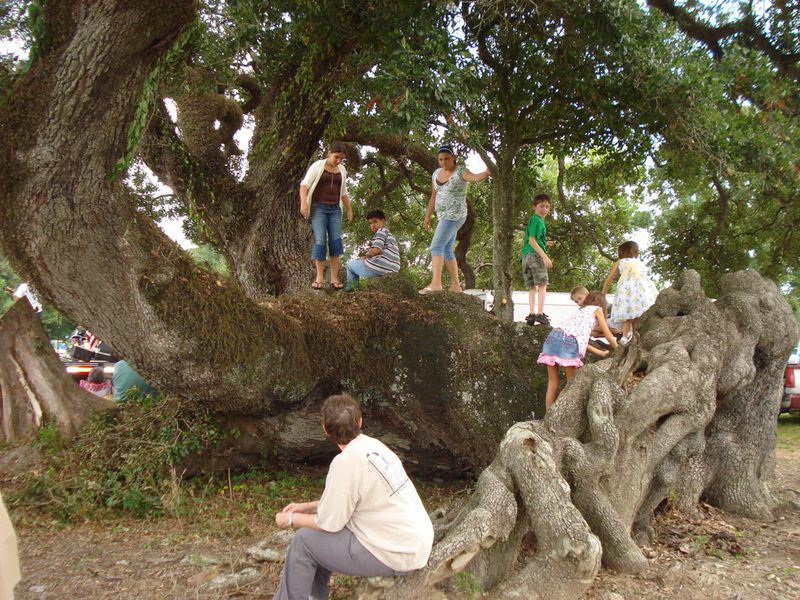 The tree was registered on May 24, 2007 after obtaining approval from the Saul Sonnier family. When efforts began to do this, stories flowed about the tree and how Saul had nurtured it through the years. The tree was probably over 100 years old when it fell, and today it adds another hundred years to its grand life. Paul Begnaud added input about the family who had owned it before it was purchased by the Sonnier family. Paul was a classmate of one the children, Maydel Broussard, who grew up on the homestead that was located next to the tree. She was one of eight children. She and her brother Jim are the only living siblings, now, but during the Survivor Celebration, they are planning a family reunion that coincides with the event. According to Jim Broussard their family had owned the land from Land Grants dating as far back as 1832, eventually adding up to a 60-acre tract. The tree was on the land when they obtained the land and weathered the storm of 1909 which, at times, is called the Storm of Grand Isle. His father had purchased his three sisters’ share in the property in 1929, when it became their homestead. The little house had already been in the family a long time. The children and their friends all grew up playing on the tree. Jim even had a dog named Rex who would climb the tree with him and amaze the friends who came to visit. Everyone grew up, except for the one sibling who died as an infant. Jim had joined the service in 1950 before the Korean War and stayed in the U.S Air Force until 1974. Upon returning home, the siblings decided that it would be in their best interest to go ahead and sell the property where they had grown up, as they were all getting older. Saul purchased the land in that same year and the house was relocated. Upon obtaining ownership of the property, Saul is said to have loved the tree. When the moving contractors relocated the Broussard house off the property, they took the liberty of cutting one of the large branches off the tree to make the job easier. Mrs. Clo Sonnier Broussard, a 1st cousin of Saul’s, worked in his real estate office for over 50 years. She was there at that time and asked him was bothering him. She tells that he was so distraught that she thought he was sick and wondered if he might need to go the hospital. He told her what had happened to the tree. She thought he was going to cry. Throughout his life he went to extra efforts to make sure the tree would be kept strong. In times of draught, he would have his kids go out with a water truck to make sure the tree did not die. The tree was special to Pierce Meleton, also, who considered the tree his favorite oak in all Lafayette – a fact he made well known to friends and family. Grandfather to the Michot brothers, they tell how Pierce had admired the tree through the years and that it inspired him, when his own oak tree fell, to leave the oak and see if it too would survive. He gave it the chance to re-root, modeling after the influence of the oak tree now known as Survivor Oak. He had watched his own tree fall before his very eyes. Representatives at both CRIA and TreesAcadiana can share more about Pierce Meleton. TreesAcadiana dedicated a special planting in memorial of Mr. Meleton not long ago. His family has their own “survivor” growing that harbors special memories of their own. On June 30, 2008, a special dedication was held when the marble marker from Green’s Marble, then owned by Bobby Castille, was completed and set where it is today. Franciscan priest Father Thomas Komenski and Father Jason Vidrine blessed the tree. The Daily Advertiser’s Bruce Brown reported on the event, which appeared on page 2 of the paper, the next day. The gathering included over 50 people, with members of the Broussard and Sonnier family, as well as representatives from TreesAcadiana and others who recognized the significance of the tree. Ms. Noelie Provost, a retired school teacher of Scott, called shortly after the tree dedication appeared in the newspaper that summer. She advised that she knew the exact date that the tree fell because it happened on the birthday of one of her aunt, Azema Martin Bacque: September 20, 1909. She told the story she had often heard told by family members about how it took Doctor Prejean, the physician in Scott, over three hours to get to the home to help with the child’s delivery. He forded through the intense storm starting out on horseback, but had to walk and shielding his head beside the neck and mane of his horse as protection from the driving wind and pelting rain that felt like bullets. Sources say that the storm was as intense as the hurricane of 1900 that devastated Galveston Island. The damage of the 1909 is documented as being extensive and its ravages claimed the lives of over 350 people. Plans for the Survivor Celebration began soon after the call that alerted us to the fact that it was about to reach a 100-year milestone in its survival. A team of four had many planning sessions to discuss the prospects of an event to celebrate the say. Andy Begneaud was one of the four. The coordination with Begneaud Manufacturing was crucial to the success of the celebration. The Zepherin Broussard family held their own family reunion in conjunction with the Survivor Celebration. Of the eight children who lived in the little house that once stood next to the oak, the two living children, Maydel (83), and Jim (80), were there, along with their children and many other relatives. The heirs of Saul and Thelma Sonnier, especially David and Judy Sonnier, were extremely helpful throughout the planning of the event. 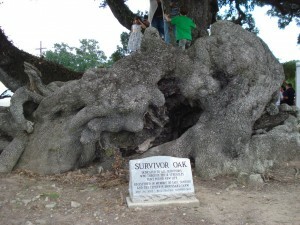 They too continue to recognize the special significance of Survivor Oak and have been supportive in every aspect of the work done to recognize the tree ever since efforts began to ensure that the tree continues to be a landmark for the area. Without Edwin Sonnier’s support, the Survivor Celebration would not have become a reality. TreesAcadiana has provided an extremely valued partner in helping establish the tree’s place among the notable oaks of The Live Oak Society. Special thanks goes to every one who realizes the important legacy of hope that Survivor Oak represents. Together, Ms. Thelma Sonnier, David and Judy Sonnier, along with Becca Begnaud, Theresa Rohloff, her friend Lisa Bergovoy and daughter, Jennifer, gathered under the oak in their own celebration of its induction into The Live Oak Society one early morning in May. Since then, the numbers of supporters in our efforts to commemorate the tree have grown and grown. There may even be a movie that evolves from the legacy of Survivor Oak. Time will tell. I remember this tree well. Zepherin Broussard was my grandfather, but he died the year before I was born. I am the daughter of Roy Broussard, who was an older sibling of Jim and Maydel. I played on this tree as a very young child when we went to visit family in Lafayette. I have fond memories of climbing on the roots of that “sideways tree” in the old farmyard. Thank you very much for your efforts to preserve this precious memory from my childhood. It is wonderful to see that that it sill stands. It is a symbol for all of us to admire.